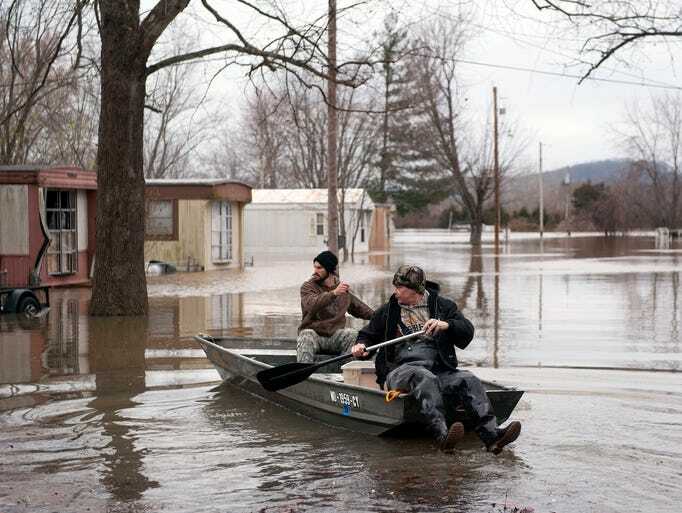 Residents in High Ridge, Missouri paddle around town during unusual winter flooding. The National Oceanic and Atmospheric Association reported that 2015 has replaced 2014 as the hottest year on historical record. An unusually large El Niño pattern in the Pacific Ocean contributed to these record temperatures. However, most of this can be explained by global warming created due to the emission of greenhouse gases. As the atmosphere warms, it holds more water vapor. As a result, larger, more violent storms and other extreme weather conditions such as heat waves, droughts, and floods have become more common. The 2014 and 2015 temperature spikes came after a period of relative cooling that began in 1998. Global warming has caused global temperatures to increase only slightly from year to year. Nevertheless, even the slightest increase can amount to extensive weather-related destruction on Earth. Gillis, 2015 was hottest year in historical record, scientists say. The New York Times (2016).